Grand Targhee weddings are sure to provide an incredible wedding experience for you and your guests in the Teton mountain range. With onsite catering, slopeside lodging, and an endless supply of outdoor activities at your fingertips, it's the perfect wedding venue in the greater Jackson Hole area to tie the knot. 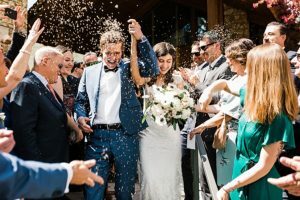 Enjoy a ceremony surrounded by aspen trees and mountain views, along with complimentary lift tickets for taking weddings day photos with the Teton Mountain Range in the background. All images by Jackson Hole wedding photographer Amy Galbraith.